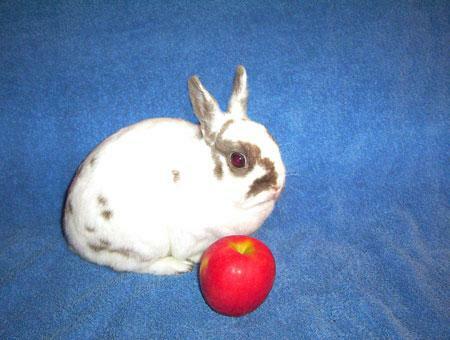 We mourn the loss of sweet, little Sabreena who was very loved by Mike and Chiho and the volunteers at SaveABunny. I am listed as a special needs bunny, because I recovered from an eye ulcer caused (we think) by e.cunniculi. I am feeling pretty good even though I am now blind in my right eye. All I need for my care are eye drops once or twice a day. Please remember that I am a sweet and loving girl who just happens to be e.cunniculi positive. I will still be a fabulous rabbit friend for you and don't seem to have any issues at all adjusting to being blind in one eye. I love attention and am cute as a button. Right now I am in a foster home and my nickname is "Ichigo", which means "strawberry" in Japanese. HI. My name is Sabreena and I am a very adorable, spayed, Netherland dwarf girl. When I was at San Francisco Animal Care and Control my name was Violet. The shelter became crowded and so I was brought into rescue at SaveABunny to avoid being euthanized. I don't think most people realize that even cute, little bunnies like me are at risk when there are just too many rabbits surrendered to shelters and not enough good homes. I only wish people would adopt from shelters and rescue groups instead of purchasing rabbits at pet stores. I hope someone will adopt me and give me lots and lots of love. I am a little shy at first, but I am eager to be loved and pampered. Just look at my precious little chubby cheeks. How can you resist me?